Swine Flu has arrived in New Zealand and, like me, you are probably wondering how to protect your family as the virus sweeps its way through the population. 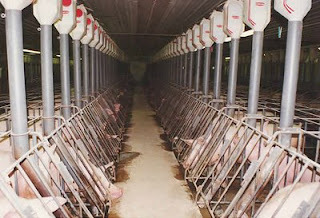 We are about to experience one of the frightful consequences of factory farming. With the onset of winter, we are fast entering the cold and flu season. Perfect timing for Swine Flu it would appear! Ensure your immune system is strong and responsive - RIGHT NOW! Yes, your immune defences need to be strong and on high alert right now. Most of us have a weakened immune system, thanks to our hectic lifestyles and nutrient poor diets. So, what can you do for your family right now to bolster their immune defences? Take a Vitamin D supplement (Refer to this article to work out the correct daily dosage for each family member). Cheap vitamin D is available off this website. Treat your family to a mid winter tropical holiday (Winter is flu season principally because this is when population vitamin D levels plummet and so does one's immune system). Increase your family's daily intake of antioxidant and vitamin C rich fruit, berries and vegetables. Bolster this with daily drinks of super plant extracts such as Nutra-Life Load Up Berry Brights and Fruitful Greens. You could add a vitamin C supplement as well for the time-being. Fruitful Greens nourish the gut and reduce inflammation. Take garlic, olive leaf and lysine supplements. These have antiviral properties. Have a little protein in each meal (You could take some whey protein small amounts over the day). Whey is known to support the gut health and the immune system. What is the Active Elements tissue salts mineral status of your family? Complete the online assessment on this site and act on the advice. Have Active 7.1 available in yoru medicine cabinet and take at the first signs of a sniffle. Reduce stress in your life - Now! Slow things down, work fewer hours, reduce debts, have a laugh each day. Have a holiday. Shut stressful people out of your life. If you have been chronically stressed you may have burned your adrenals which are at the heart of immune health (This includes children). Check my articles about adrenal fatigue and start the adrenal restoration programme now - even if you consider yourself a mild case. Get restful sleep each night. Deep sleep is at the heart of immune health, so ensure you have a good night's kip. If not, have a look at the supplements on this site that safely aid deep sleep, or contact me for assistance. These measures, along with the usual ones (hand washing etc) will reduce any risk of catching all flus and colds. More important: These measures will ensure your family's immune systems will react swiftly and strongly to any viral invaders, ensuring that they get over the infection quickly and with the least discomfort and fewer, if any complications. To learn more, please click on the key words below this article. And please vote for me now in the NetGuide Awards!